Great attention was paid to the look of this site. We were tasked with the requirement of conveying the atmosphere of the Good Taste café in Keswick. The core business is the Lake District café but there were some other areas of the business that also needed attention through the website. The Cookery School and Studio Dining experiences have been driven through the site too. But there also book launches and a wide and varied range of Outside Catering challenges to cover. The branding and design elements implemented on this site have proved very popular amongst visitors to both the café and site. This emphasis on a strong visual design has been a success and has resulted in it being used in all publicity and marketing activities since. All proofs for any traditional print media were supplied by us direct to the printers (we have established contacts in this area if required). Their newsletter templates were built around the design too, we handle all our mass mailing services in house. A particularly successful element of this site is the selection of podcasts. The MP4 formatted content is hosted on the site and we have then made it available to the iTunes catalogue through the submission of the podcast details to allow categorisation and an effective listing. 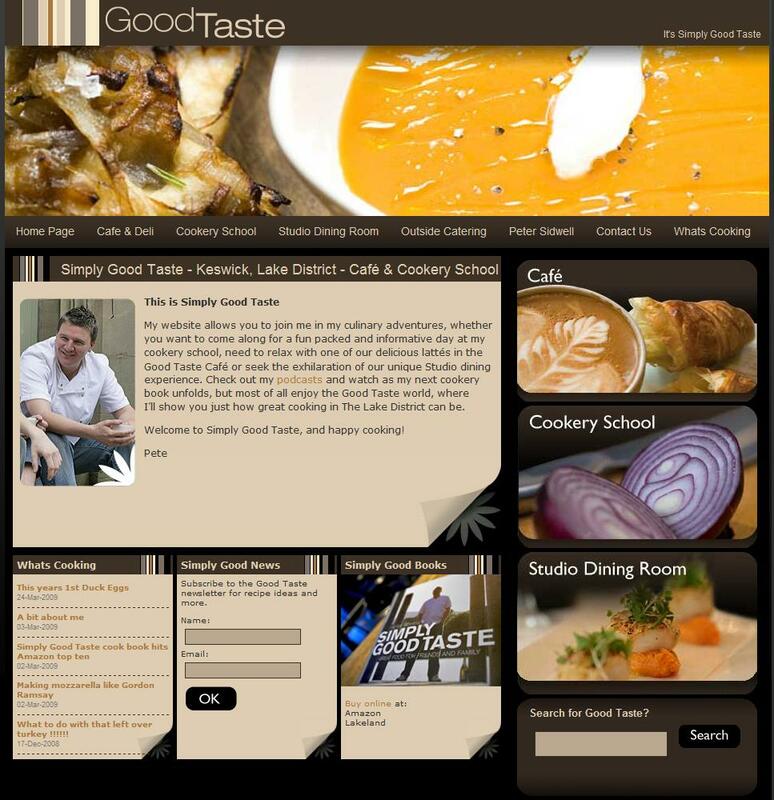 They have helped to generate significant interest in the Simply Good Taste brand. Media sharing sites such as YouTube and Blip.tv are also used and are an ever growing source of traffic (these are a part of the wider phenomenon of social networking sites). Recently we have started providing an extra monthly support service to this site; we are now providing Search Engine Optimisation for their key business areas. But more urgently we are providing a content proof reading service to make sure it is well written for both visitors and search engine indexes. This will be a continuous task but it will take us some months to bring the current content up to scratch. This case study was posted on Monday, April 21st, 2008 at 5:29 pm. Back to Case Studies archive.